Driving under the influence (DUI, also sometimes called OVI or DWI) is one of the most commonly committed crimes in the United States. Unfortunately, because this crime is so common, many people make the mistake of taking their DUI arrests lightly instead of seeking appropriate legal representation. If you've been charged with DUI in Cincinnati, OH, your first step should be to discuss your charges with DUI/OVI lawyer Joel G. Deutch, Attorney At Law. He has over 20 years of experience dealing with Prosecutors and Judges. He knows what witnesses to identify to help your case and works with experienced toxicologists to examine your breath test results in order to get the best plea bargain and/or help to exclude your breath test results at the time of trial. The first thing that you need to understand are your rights. You don’t get to choose whether you can submit to a breath test, urine test or blood test. The officer makes that choice. The most frequent test completed is breath test. You have to understand whether you should take the test or refuse the test. If you are put into a situation to make a quick decision tell the police you want to contact JOEL G. DEUTCH, ATTORNEY AT LAW FOR A FREE CONSULTATION. YOU CAN REACH JOEL AT 513-886-7478. This is his 24 hour emergency number. He answers his phone personally and is available to take your calls. Your lawyer must understand quickly during that emergency phone call whether you should or should not take the breath test. If the wrong decision is made your driver’s license will likely be suspended and this will impact your ability to support you and your family. Therefore, it is essential your lawyer understands the techniques in administering the breath test. Your breath test has to be performed on a device that is calibrated correctly accordingly to stringent standards set forth by the Ohio Dept. of Health. If the breath test device is not maintained and/or calibrated correctly your breath test results may not be admissible at the court hearing on your case. Therefore, you must have an experience lawyer familiar with these specific guidelines and rules. JOEL G. DEUTCH ATTORNEY AT LAW STAYS ABREAST OF THE CURRENT DEVELOPMENTS OF SUCH REQUIREMENTS TO PROTECT YOUR RIGHTS. If you are pulled over for an DUI/OVI, it is essential to ask for limited driving rights. There are specific rules that need to be followed to receive these driving privileges. JOEL G. DEUTCH KNOWS HOW TO ASK FOR THE PRIVILEGES THE RIGHT WAY AND TO KEEP YOU DRIVING SO YOU CAN CONTINUE TO WORK. You don't have to submit to the field sobriety tests. There is no current penalty for refusing to perform the field tests on the side of the roadway. Get your insurance card and driver's license out before the police officer comes to your window. Don't run the risk of not being able to locate these important pieces of information. Ask to speak to an attorney BEFORE your submit to a breath test or any chemical test. 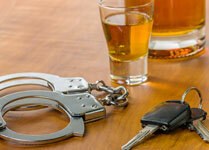 REMEMBER YOU HAVE CHOICES AND DEFENSES AFTER BEING CHARGED WITH A DUI/OVI. CALL JOEL G. DEUTCH AT 513-886-7478 FOR YOUR NO COST AND NO OBLIGATION CONSULTATION. Understand your charges and the possible penalties. Determine which defenses apply to your case and whether to file motions to suppress the arrest and/or stop by law enforcement. If you refuse the breath test the State will impose a mandatory one year driving suspension. This is called the Administrative License Suspension. If you submit to the breath test and the results are in excess of the prohibited blood alcohol content you will receive a 90 days state suspension. This is also called the Administrative License Suspension. If you are found guilty and/or convicted of a first time DUI/OVI offense there is a mandatory 3 day jail sentence you are required to serve. You may be able to serve the 3 day jail sentence in a driver intervention program and not in jail facility. There is a minimum fine if you are found guilty of $375 and a maximum find of $1075. The Court will also suspend your drivers license for at least 6 months and up to 3 years. It is possible the Court will grant driving privileges on your first offense but may require you to install a ignition interlock device (breathing device) on your car as a requirement to receive driving privileges. You can be placed on probation for up to 5 years for a first time guilty finding. If you are convicted of a DUI/OVI and your breath test is considered a high tier test, you will also be ordered to serve an additional 3 days in a jail setting and be required to have restricted license plates on your car.